I’ve been an S Club member since the beginning. I bought the original iPhone on day one and, since then, have purchased a new iPhone every other year. I’ve owned the original iPhone, iPhone 3GS, iPhone 4S, iPhone 5S, and iPhone 6S — hence the “S Club” distinction. And although there isn’t a new S-branded iPhone this year, it’s still time for me to upgrade. 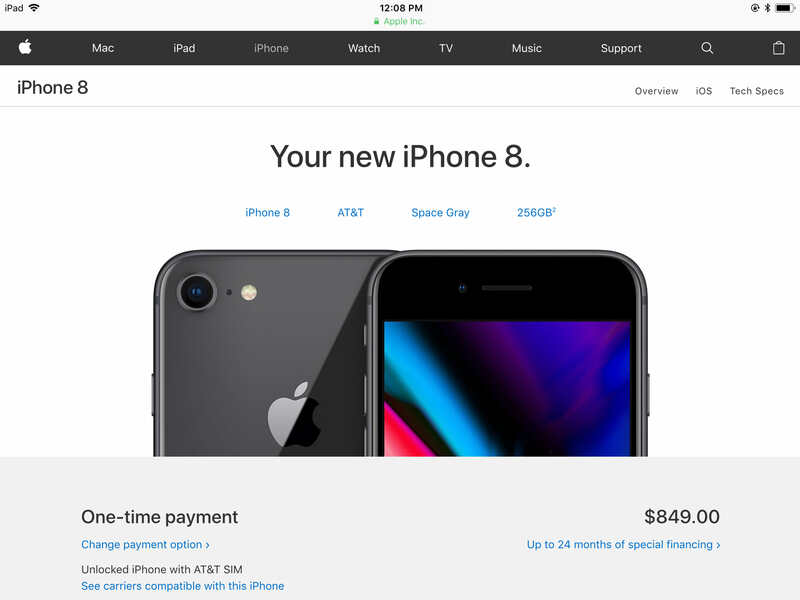 I normally would have been up at three o’clock in the morning last Friday, placing my preorder alongside all of the other iPhone enthusiasts. But this year, my wife and I are purchasing a house. We’ll be closing tomorrow, packing, and moving the following week. Now, I don’t know if you’ve heard this or not, but buying a house is a tad costly. I’ll still buy a new iPhone this year, but it will have to wait a few more weeks — I’d like to get settled into the new house first. And I already have a model in mind that I plan on purchasing — the iPhone 8 with 256GB of storage in space gray. The color decision was easy for me — it’s the only option with a black front. I’ve always found iPhones with white bezels to be significantly less attractive than iPhones with black bezels. The visible camera and sensors, the display sticking out like a sore thumb when it isn’t illuminated — it’s just ugly. If Apple made an iPhone in a different color with black bezels on the front, I’d buy it. But until then, I’m sticking with space gray. Deciding on 256GB over 64GB was a little less cut and dry for me. Right now I’m using a 64GB iPhone 6S and I haven’t ran into any storage issues. But I plan on owning my next iPhone for two years. I have about 11GB free on my 6S, will that be enough breathing room for the next two years? I don’t really know. But the last thing I want is to start bumping up against the storage limitations on such an important device. I’m not thrilled about spending an extra $150 on the additional storage, but Apple has left me with no other option. The device is only available in 64GB and 256GB capacities. It’s a shame that Apple has relegated the 128GB capacity to older models. 128GB would be much more appropriate for my needs and could theoretically help save me some money if the option was available. But why would I purchase the iPhone 8 over the iPhone X? The price is definitely a factor on this one, although not as much as one might expect. I wouldn’t be happy about spending over a thousand dollars on a new smartphone, but I would have done so if the iPhone X included more features that I felt like I just needed to have. The reality is, the iPhone 8 and iPhone X have a lot in common. They both feature Apple’s A11 Bionic chip, support for wireless charging, True Tone, and wide color displays. The iPhone X obviously has some nice features that the iPhone 8 doesn’t — an edge-to-edge OLED display, Face ID, the dual-camera system, Portrait Mode, Portrait Lighting, and Animoji — but I don’t think they’re worth spending an extra $300 for. And that’s not to mention the concerns I have about the iPhone X’s software. I think their decision to embrace the notch is terrible, I hate that Control Center and Notification Center are both accessed by swiping from the top of the screen, and I’m uncomfortable with the idea of an iOS device without a home button. One of the reasons I’ve enjoyed upgrading my iPhone on the S-branded years is that it gave Apple twelve months to refine the new form factor. You can see this with the new antenna design introduced on the iPhone 4S and the increased rigidity of the aluminum on the iPhone 6S. This is the first S-cycle year with a brand new design and I would rather continue on my path of purchasing tried and true form factors than jump into something that hasn’t been battle tested by the mass market. Along the way, I’ll get to save a bit of money. Which will be greatly appreciated as my wife and I purchase new furniture and make some improvements to our new home. And it’s not as though the iPhone 8 is just another boring iPhone 6-style design. The iPhone 8 is a bigger upgrade from the iPhone 7 than the iPhone 7 was from the iPhone 6S. It features a glass back, a new color option, wireless charging, and faster chips. The iPhone 8 only feels boring because it was announced at the same event as the iPhone X. The iPhone 8 is still an exciting device, especially if you care about getting the most for your money.